Please note: Ticket Deadlines for the 2017/18 Arsenal Season is now open. 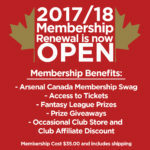 All members of Arsenal Canada are eligible to request a ticket for an Arsenal home match, and any league cup match that Arsenal plays in except if Arsenal reach the final. The ticket policy is one ticket per membership, if you have someone joining you for a match, they need to be an Arsenal Canada member as well. Ticket windows for overseas supporters clubs close approximately 10 weeks prior to kickoff, and before the Silver ticket window for Arsenal opens. This allows overseas supporters to have their ticket(s) confirmed far enough in advance to confirm travel and accommodations when traveling for a match. Once a deadline passes it can take about a week for Arsenal to confirm the number of tickets that each supporters club has received. In rare circumstances we request more tickets than are made available to us. In those instances the Ticket Liaison will assign the tickets that Arsenal Canada receives on a first come first served basis. Arsenal Canada will post ticket application deadlines as they are given to us by Arsenal. Ticket application deadline information can be found here, on our ArsenalCanadaSC twitter account and on the Arsenal Canada facebook page. To apply for tickets, click on the ticket deadline and use the form to request the tickets. The email will go directly to our Ticket Liaison, Kelsey Mori, who will get back in touch with you. Please note that all match times are subject to change. Should you have any additional questions, please send an email to us using the contact form found here.